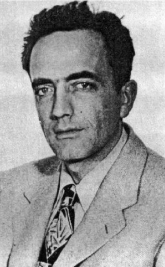 Fritz Leiber (1910 – 1992) was an American author of horror, science fiction and fantasy, credited with coining the phrase “sword and sorcery” and forging new paths in that genre with his immortal tales of Fafhrd and the Gray Mouser, a pair of heroes whose first adventure appeared in one of the earliest issues of Unknown in 1939. His first novel, Conjure Wife, a notable horror classic, also had its first appearance in that relatively short-lived magazine helmed by the venerable John W. Campbell. Leiber followed up with a second novel, the now-classic Gather, Darkness!, which appeared in Astounding in 1943. His first collection, Night’s Black Agents, was published by Arkham House in 1947, continuing a long career that won him accolades, admirers from all genres, and a huge number of awards. He won six Hugos and several Nebulas. He won the World Fantasy Award in 1975 for “Belsen Express” and again in 1977 for Our Lady of Darkness, a novel he wrote after a dark period in his life following the death of his first wife, when he struggled with depression and alcoholism. He was given a Gandalf Grand Master Award by the World Science Fiction Society in 1975, and the World Fantasy and Bram Stoker awards for Lifetime Achievement. Leiber’s work was an influence on many writers, including Harlan Ellison, Ramsey Campbell and Neil Gaiman to name just a few. Leiber is widely acknowledged to have had a hand in shaping modern fantasy, and used fantasy motifs in modern day settings long before urban fantasy was a popular sub-genre. While his numerous novels and novellas were mostly fantasy and science fiction, he also wrote amazing horror stories collected in many volumes throughout the years. He lived out his later years continuing to write and receiving royalties from TSR, who licensed rights to use characters from his world of Lankhmar in Dungeons & Dragons. Born in Chicago, Leiber earned a Bachelor of Psychology degree from the University of Chicago and went on to study at the Episcopal General Theological Seminary in Washington, D.C. According to a brochure from Easton Press, he served as a minister at two Episcopalian churches in the early 1930s. Some of his other professions included college professor, airplane inspector, and associate editor of Science Digest. Leiber was a chess enthusiast, an avid cat person, and a poet. Following in the footsteps of his father who was a Shakespearean actor, Leiber appeared in a handful of films in the 1930s, a 1970 horror film Equinox, and a 1979 documentary based on the non-fiction book The Bermuda Triangle by Charles Berlitz. He was married twice and died suddenly in 1992 of “organic brain disease,” according to Wikipedia. His autobiography, written in the early 1980s, can be found in the 1984 Ace edition of his collection Ghost Light, shown below. You can hear Fritz Leiber’s wonderful and poignant live reading of Clark Ashton Smith’s “A Night in Malneant,” which I found quite moving, thanks to Will Hart at CthulhuWho1. Alternatively, in the event that blog should disappear, you can download the file here, or listen using the media player below. Many of Leiber’s works are still in print and available in ebook formats. To see what’s out there, click here. The cover scans below are from the library of author Christopher Fulbright. The featured image for this post is from cover art by Jack Gaughan.